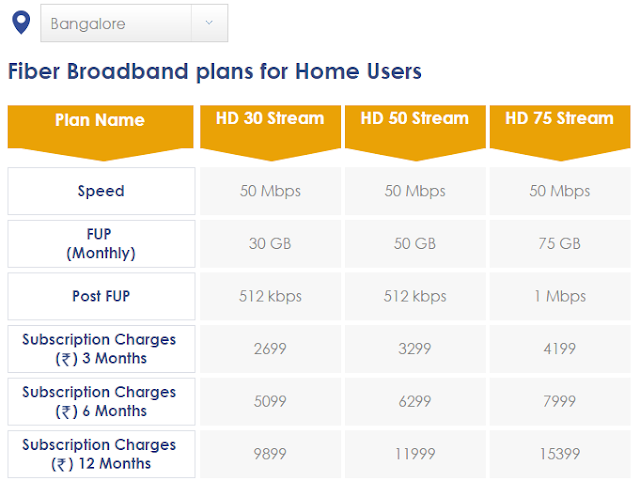 Hathway broadband has basic required plan according to data usage. The plan is different for each city. 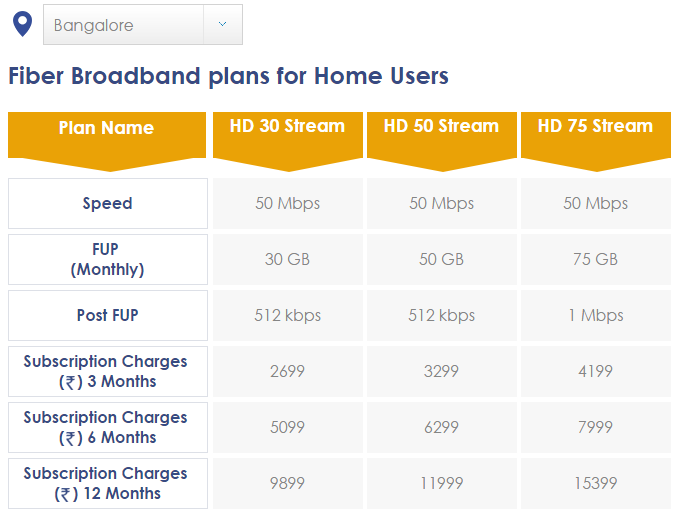 For Bangalore, You have three different plan for 30GB, 50GB, and 75GB. It will cost you around 1000 rs, 1200 rs and 1400 rs per month respectively. You can avail free WiFi router and modem if you recharge with 3 months directly for the first time. And no need to pay installation charge of 500 rs as well. Overall plan is good and much more similar to other service providers like Tikona, Reliance, Airtel, ACT et., But they are giving higher speed of 50mbps which is not given by another service provider in this price range. Of course ACT is one of the best service providers of internet service, I have used ever, which can provide you the speed of 50 Mbps with the same amount of data in around 1399 rs. I believe Airtel is best in service and you will never face issue once and installation is done. But plans are costly as compare to hathway and ACT broadband. If you are looking for cheap data plans then go for YOU broadband, where service is not much reliable, but plans are good. Service are better as compared to YOU broadband. At least I have not faced any issue till now. I have used it for around 3 months. Charges are more than YOU broadband, but service is good. Though they will say the speed of 50 Mbps but actual speed will be around 10 Mbps to 15 Mbps. Hathway broadband services are available in the following location in India.